RBL Bank Ltd made a strong stock market debut on Wednesday with its shares listing at a premium of almost 22% to the issue price and extending gains to close 33% higher. The bank’s shares started trading at Rs 273.70 apiece on the BSE compared with the initial public offering price of Rs 225 apiece. The shares touched a high of Rs 305 before ending at Rs 299.30, giving the private-sector lender a market value of Rs 11,068 crore ($1.65 billion). The benchmark BSE Sensex gained 0.4%. The spectacular listing comes after the initial public offering of RBL Bank Ltd was subscribed almost 70 times, as investors bid heavily for shares of the first private-sector bank to go public in a decade. RBL Bank joins a string of companies that have made strong market debuts this year. Diagnostics firm Thyrocare surged 48% on its listing day in May. Quess Corp climbed 57% on debut while enzyme maker Advanced Enzyme Technologies Ltd soared 35% on listing. All these companies also had recorded strong investor interest in their IPOs. Business services provider Quess Corp's IPO covered 144 times while that of Advanced Enzyme got bids for 116 times, making these the biggest and the second-biggest offerings by subscription in eight years. Thyrocare’s public offering was covered 73 times. The success of these IPOs comes after market volatility in the first half of this year had forced several firms to skip their planned share sales. However, a rebound in the secondary markets over the past couple of months has offered hope to companies looking to float IPOs. The benchmark indices are now trading at their highest levels in more than a year. The lender, earlier known as Ratnakar Bank Ltd, had fixed Rs 224-225 a share as the price band for the IPO. This translated into an issue worth Rs 1,213 crore ($182 million) at the upper end of the price band and valued the lender around $1.25 billion. RBL Bank had earlier cut the size of the IPO after it raised capital from a bunch of investors in a pre-IPO placement late last year and as its selling shareholders trimmed the offer for sale. The lender cut the size of both the fresh issue and the number of shares on offer for sale. Originally, it had sought to raise up to Rs 1,100 crore ($162 million then) through a fresh issue of shares and an offer for sale of 17.56 million shares by some shareholders. The revised IPO raised Rs 832.5 crore ($125 million) through the fresh issue and comprised an offer for sale of up to 16.9 million shares. One of its private equity investors, Beacon India Private Equity Fund, sold all its shares. Gaja Capital and Capvent part-exited in the IPO. On Wednesday, another private equity firm, TVS Capital, sold shares worth Rs 76 crore in RBL Bank. 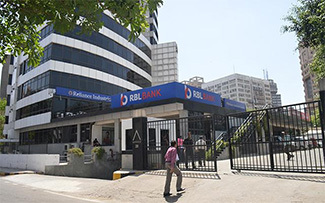 RBL Bank had received approval from the Securities and Exchange Board of India (SEBI) on 27 July, nearly a year after it applied. The issue got delayed as the capital markets regulator had asked the bank to resolve the issue of past violations of the Companies Act, wherein it had issued securities to a higher number of subscribers than permitted. SEBI agreed to settle the case in June. Ahead of the IPO, RBL Bank had raised Rs 364 crore ($54 million) by selling shares to anchor investors including private equity firm ChrysCap and Wipro chairman Azim Premji's investment arm, PremjiInvest. Before RBL Bank, the last private-sector bank to float an IPO was YES Bank in 2005. In 2010, state-run Punjab & Sind Bank went public.